﻿ SearchExpress Document Management lets you use eForms instead of paper forms. You use SearchExpress to easily and quickly design eForms, such as Registration and Job Application forms. The customer or employee selects the eForm from a list of eForms on your Internet or intranet site, or you can email the eForm to the user. You can send a group of eForms in an envelope, e.g., all the eForms a new employee needs to complete. The user completes the eForm or eForms. 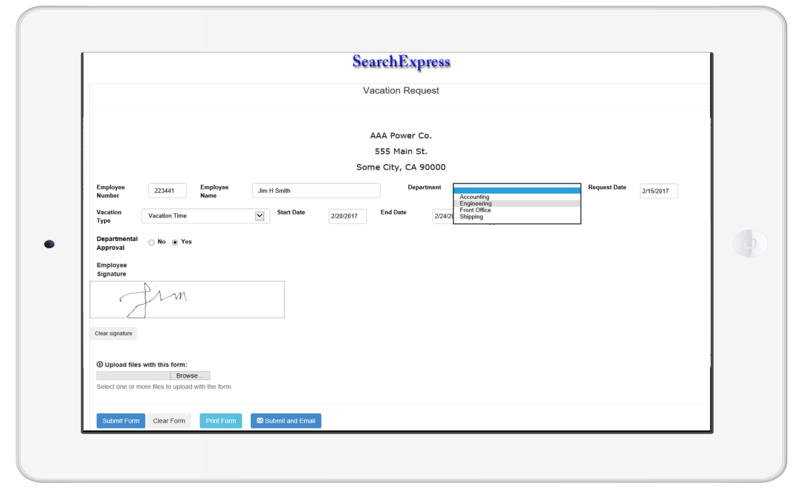 SearchExpress provides speech recognition to optionally complete eForms using speech, instead of typing, which can be particularly handy from a mobile device. Form pick lists, shown to the user, can be populated in real-time from live database links. The pick-list entries can be shown as radio buttons or checkboxes. The user can sign their signature on the eForm by using their finger, on an iPad or smartphone, or by using their mouse, on a PC. You can have multiple signatures on one eForm, and these signatures can be signed at different times by different people. The user can attach a photo or drivers license or other file to the eForm. The form adjusts automatically to any device size: smartphone, iPad, PC. SearchExpress records the geolocation, IP address, date and time of eForm submission. The user can enter a name or other fields, and click lookup, and form data can be pre-populated from another database. For example, you can enter an Employee Number and SearchExpress can read the Employee Name and DOB from your HR system. Use an eForm to accept payments, e.g., a student could see their “Amount Due”, based on their email login, and pay via credit card. Or, for a shopping cart, a customer could use an eForm to enter their name and shipping address and select products to buy and quantities, and pay the calculated total by credit card. Completed forms are saved to the SearchExpress document database, and can be searched by content. SearchExpress can also write the form data to your Human Resource, Enterprise Resource Planning, Electronic Medical Record, Student Information, or other systems and databases. SearchExpress Document Management software lets you capture, index, route, search and manage your digital documents as well as your paper documents. You save emails, Word and other Office documents directly to SearchExpress, without printing or scanning them, by using a Save-to-SearchExpress menu item in Outlook and Office. SearchExpress Document Management is easily integrated with your existing business-critical applications so you can share data with your other applications and view your documents from your other applications. You can search by typing in a word or phrase. Also, you can search by highlighting a search word or phrase in your CRM, ERP or other applications, including Oracle eBusiness, PeopleSoft and SAP. SearchExpress is enterprise document management software that organizes your documents, in compliance with legal regulations, in a secure document repository. SearchExpress provides search and document workflow to automate business processes and ensure people have the information they need, at the time they need it. For document management system search features, click here. For document capture and indexing features, click here.